A beginner in subordinate place must take upon himself the labor of advancing. There might be an opportunity of surreptitiously easing the way - symbolized by the carriage - but a self-contained man scorns help gained in a dubious fashion. He thinks it more graceful to go on foot than to drive in a carriage under false pretenses. This hexagram shows a fire that breaks out of the secret depths of the earth and, blazing up, illuminates and beautifies the mountain, the heavenly heights. Grace - beauty of form - is necessary in any union if it is to be well ordered and pleasing rather than disordered and chaotic. Things should not unite abruptly and ruthlessly; hence there follows the hexagram of Grace. Grace is the same as adornment. The most perfect grace consists not in external ornamentation but in allowing the original material to stand forth, beautified by being given form. The upper trigram Gen, the mountain, is disposed to remain still; fire, Li, blazes up from below and illumines the mountain. This movement is strengthened by the nuclear trigram Zhen, which likewise moves upward, while the resting weight of the mountain is activated to a falling movement by the lower nuclear trigram Kan. Thus the inner structure of the hexagram shows a harmonious equalization of movement, giving no excess of energies to the one side or the other. This hexagram is the inverse of the preceding one. “Grace has success.” The yielding comes and gives form to the firm; therefore, “Success.” A detached firm line ascends and gives form to the yielding; therefore, “In small matters it is favorable to undertake something.” This is the form of heaven. Having form, clear and still: this is the form of men. If the form of heaven is contemplated, the changes of time can be discovered. If the forms of men are contemplated, one can shape the world. The text of the commentary does not appear to be intact. There seems to be a sentence missing before, “This is the form of heaven.” Wang Bi (226-249) says: “The firm and the yielding unite alternately and construct forms: this is the form of heaven.” This was taken as the original text, now missing, but Mao Qiling (1623-1716) takes another view and sees in it only an explanation of the foregoing sentence. But something of the sort must in fact be presupposed. The yielding element that comes is the six in the second place. It places itself between the two firm lines and gives them success, gives them form. 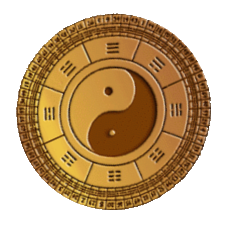 The strong element that detaches itself is the nine at the top. It places itself at the head of the two upper yielding lines and gives them the possibility of attaining form. 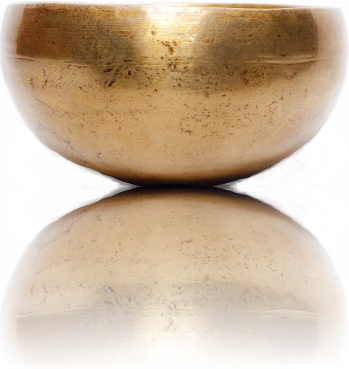 In each case, the yang principle is the content, the yin principle the form. 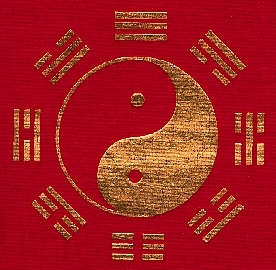 In the first case it is the yin line that bestows form directly and therefore brings about success, whereas the ascending yang line, by lending content, only indirectly provides the material on which the otherwise empty form of the yin lines can work itself out. Hence the effect is that it is favorable for “the small” to undertake something. 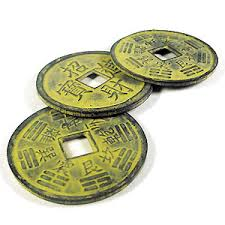 The form of heaven is symbolized by the four trigrams constituting the hexagram. 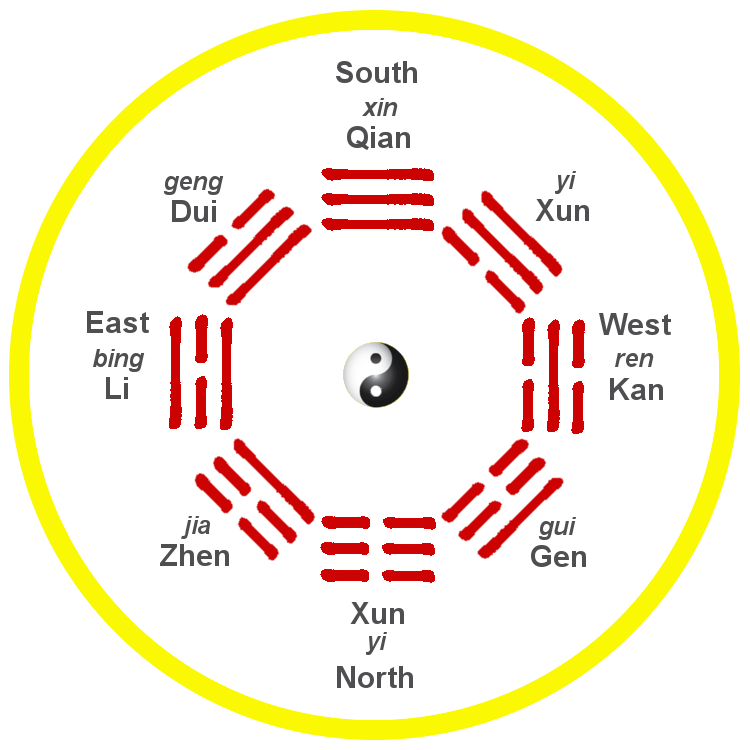 The lower primary trigram Li is the sun, the lower nuclear trigram Kan is the moon; the upper nuclear trigram Zhen by its movement represents the Great Bear, and the upper primary trigram Gen by its stillness represents the constellations. If one observes the rotation of the Great Bear, one knows the course of the year; through contemplation of the course of the sun and the phases of the moon, one recognizes the time of day and the periods of the month. The form of human life results from the clearly defined (Li) and firmly established (Gen) rules of conduct, within which love (light principle) and justice (dark principle) build up the combinations of content and form. Here too love is the content and justice the form.